We like Rand Paul around these parts. Our premier post by SR Mann highlighted Paul’s filibuster against President Obama’s drone policy. It was a rare victory for conservatives and libertarians in what has been a series of defeats, both politically and in public relations. It was quite a moment. 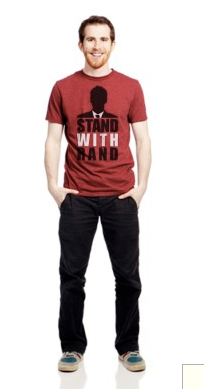 When Paul was at CPAC, his staff was giving out (or selling) the really cool t-shirts you see above. We are going to give away two of those shirts! Sorry guys, but the model does not come with the pink shirt! Of course we’re glad Senator Paul and his staff included apparel for the ladies so anybody can win. It’s easy! But make sure you follow the instructions carefully. Don’t say we didn’t warn you. Follow Pocket Full of Liberty on Twitter. That’s it! We will choose two random winners at 9:00pm EST on April 2nd! Once we’ve chosen, we’ll give you a shout out on Twitter, collect your info and send you your shirt! While it’s not required, we’d love for you to like our Facebook page and drop us a line in the comments about any subjects you’d like to see us cover. BTW they have other gear as well. Check out the store. *** Please note this website is not affiliated in any way with Rand Paul 2016. This is just us giving away some cool stuff!